"From Turner to Monet. Brittany Discovered by 19th century Landscape Artists"
This catalogue, published at the time of the exhibition held at the Musée des Beaux-Arts in Quimper from April to August 2011 which we, unfortunately, were not able to see, and co-edited by the museum along with éditions Palantines, is a fine example of serious publication work. Although current publishing trends, a certain glibness and at times, there is no denying, financial constraits tend to transform some exhibition catalogues into "not much there", with a lineup of essays, in the best of cases, and an album of average reproductions, what we have here is a work of demanding scholarship, concern for detail, a consistency in its theme as well as constituting a veritable reference work to accompany the exhibition itself. True, André Cariou’s book, since this is in fact a book with an author, has as its main title "From Turner to Monet" : we will restrain from rebuking him in any way, well aware of communication demands, the pressure from municipal agencies and the need to appeal to the public. Would there have been as many visitors (the exhibition was indeed very successful) if there had been a more accurate reflection of the works presented by choosing a name such as "From De Louis-François Cassas to Clairin" ? We all know the answer. And yet the importance of this work is indeed the fact that it illustrates how Britanny was discovered throughout the 19th century and beyond, through a variety of themes, viewpoints and artists who came from different backgrounds and aesthetics. 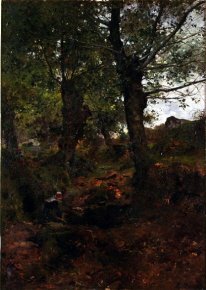 Recalling the role of one or another of the great artistic masters of the time would not be adding anything new unless associated to many more less-known painters, some even forgotten but just as interesting and who give this "landscape" its full reality and significance. This also corresponds to a purely historical necessity : what kind of geography shows the rivers without their affluents ? Divided into twelve chapters, André Cariou’s work combines a chronological itinerary with a thematic approach. With no systematic purpose, the sections follow the logic of the paintings themselves and art history as well as the development of the discovery of Britanny. Thus, several chapters underscore certain criteria linked to known movements or artistic questions - « Les Barbizon bretons » ("The Briton Barbizons"), « La Bretagne symboliste » ("Symbolist Britanny"), « Nouvelles expérimentations à l’aube du XXe siècle » ("New Experiments at the Dawn of the 20th century") - while the chronology relates the « Premières venues à la fin du XVIIIe siècle » ("First Arrivals at the end of the 18th century") or « Les Premiers découvreurs « Les Premiers découvreurs » ("The First Discoverers"). Elsewhere, the works are assembled by thematic subject as in the chapter on « La terre du Romantisme » ("The Land of Romanticism"), the one on « Nature idyllique » ("Idyllic Nature") or the sections on « Côtes à l’infini » ("Infinite Coastlines") and « Empreinte des images du passé » ("The Trace of Images from the Past"). However, the author always maintains a historical, documented approach, the specific context in Britanny and aesthetic considerations in his analysis ; the works illustrated in each of the chapters are accompanied with remarks in the text, becoming in a way "giant entries". Thus avoiding what is sometimes a rather insipid labor for the general public who usually is left to read separate entries, the book blends all of the approaches constituting this knowledgeable study into a continuous text which results in a clear and attractive narration. In the preface, André Cariou warns us that this is not a comprehensive work and, we could of course suggest other artists (such as the Americans Lionel Walden and Maurice Herter) or other works. As is, the selection is nevertheless sufficiently representative and varied enough to illustrate the stated purpose. We were obviously pleased at the chance to once again admire the celebrated works of Whistler, Turner, Corot, Boudin, Daubigny, Monet and Redon all placed in perspective. Some artists are represented here with striking works which we never tire of : René’s Farewell to his Sister by Turpin de Crissé (ill. 1), the impressive The Path to Rustéphan by Léon-Germain Pelouse (ill. 2) and the very poetic Tronoan Calvary (sic) by Jacques Guiaud (ill. 3). We also admired the works by Jules Coignet, the enigmatic views of the Rance river by Pierre-Henri de Valenciennes and the watercolors by Eugène Isabey, the son of the famous miniature artist. Although the last chapter evokes Gauguin, Luce, Signac, Russel and Guillaumin, familiar painters, the reader will meet many new names in the book. 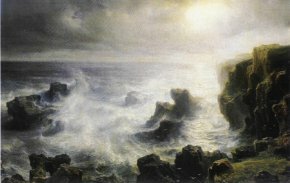 The almost hypnotic paintings of Octave Penguilly-L’Haridon (whose hieratic style is a precursor to Alexandre Séon’s landscapes), the very pure art of Emmanuel Lansyer, the impressive Storm on the Coast of Belle-Ile by Théodore Gudin (ill. 4) and the nightmarish lithographs of shipwrecks by Ferdinand Perrot form some of the countless visions which Britanny summoned up in all of these artists. Indeed, the connecting thread here is of course the attraction, even fascination, which Britanny’s landscapes exerted over several generations of artists (including poets and musicians) from the end of the 18th to the beginning of the 20th century. 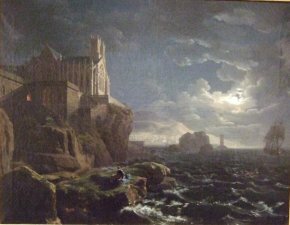 Faraway and mysterious lands, often still barely accessible, unchanged by secular traditions, dominated by legends and myths, cradled by stormy oceans and associated with a lifestyle often no longer in tune to the modern advances in the rest of France : nothing could seduce, intrigue and inspire artists more than the magic of Britanny. 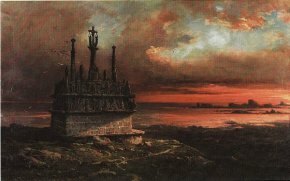 The book’s outstanding quality is the documentation of the works, artists, context, history and ports of Brest and Lorient as well as the picturesque views of the cities, the stone alignments, the dark forest interiors, the distant horizons ; other than the the historical context and the questions related to the history of painting, Britanny constituted something more in the works of these artists. A land of "revelation" due to its scenery and its "aura", the region allowed painters, even if only on occasional visits or perhaps just one, to witness something different : thanks to this unique encounter with the sky, the sea, the landscapes, the architecture, the history, the people and the legends, the artists who painted Brittany between 1780 and 1920 went far beyond... Is it possible that the discovery of Brittany helped them to rediscover, renew, the artists themselves ? This is in any case the feeling that André Cariou’s book gives the reader and, no doubt, the impression left by the accompanying exhibition in the minds of museum goers. Given this kind of success, we often wonder if elected officials are aware of the work accomplished by the directors of "their" museums and how lucky they are to have them ; more than just the number of visitors (which does not always translate into income for the museums themselves and goes into municipal coffers), this represents a valuable aid to heritage preservation and an essential scholarly contribution, the result of the hard work put out by museum employees with total devotion and in a consistent manner as demonstrated by this excellent publication. André Cariou, De Turner à Monet. La découverte de la Bretagne par les peintres paysagistes du XIXe siècle, Editions Palantines, 2011, 192 p., 32€. ISBN : 9782356780423.